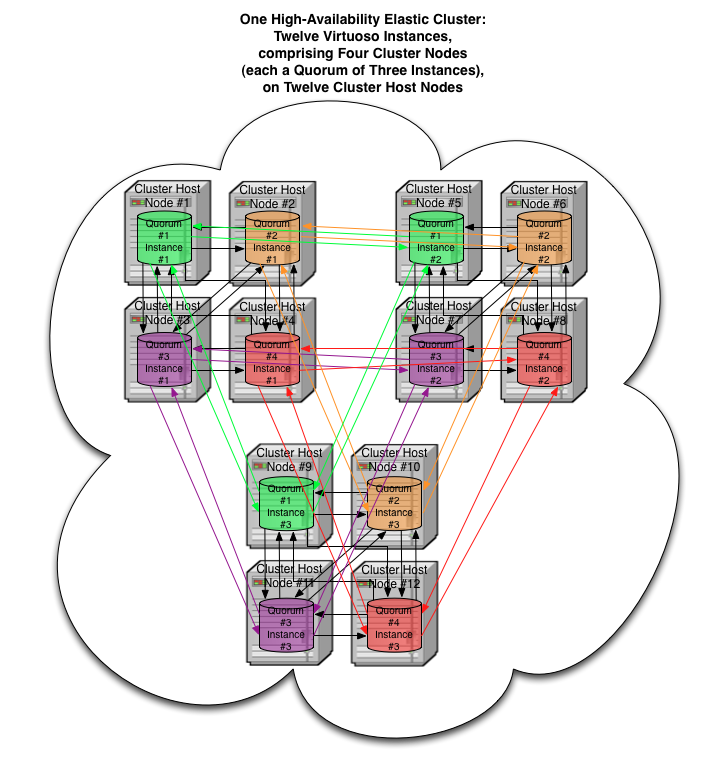 Does my Virtuoso deployment support Replication Clustering and/or Elastic Clustering? Replication Clustering is a feature of all Commercial Editions of Virtuoso 6 and later. It is not available for use in the Open Source Edition (VOS). 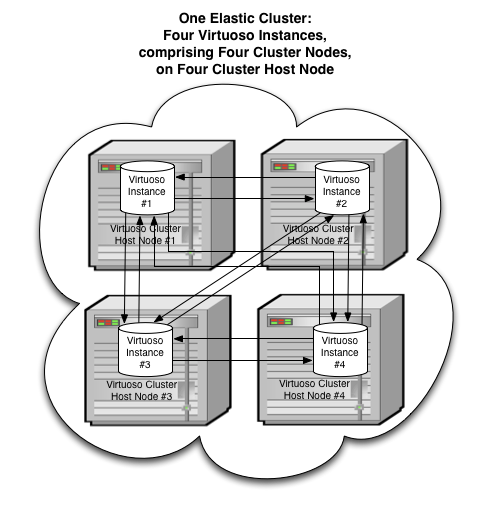 Elastic Clustering is enabled by the add-on Cluster Module of Virtuoso 7 and later. It is not available for use in the Open Source Edition (VOS). Replication clusters provide redundancy and disaster recovery, and can provide some degree of load balancing and high availability -- but the downstream subscribers (commonly called "slaves") are entirely dependent on the upstream publishers ("masters") for their data. READ clients may be allowed to access any instance, but they will only get whatever data has flowed downstream through the replication topology at that point. 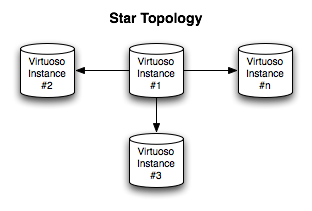 In Star or Chain topologies, WRITE clients should only access the most upstream instance, so that all changes flow to all other instances. In a Bi-directional topology, it doesn't matter which instance a WRITE client targets -- but issues can arise from collisions, when conflicting WRITEs are made to opposite ends of the stream. 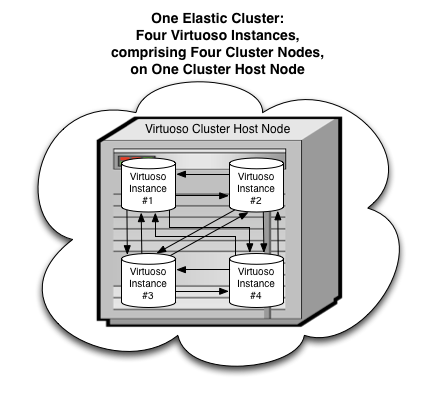 Shared-Nothing Elastic Clustering is enabled by the Cluster Module, an optionally licensed component of Virtuoso 7 and later. Clients may access any instance in an Elastic Cluster, and every instance in the Elastic Cluster effectively has all data available to it at all times. 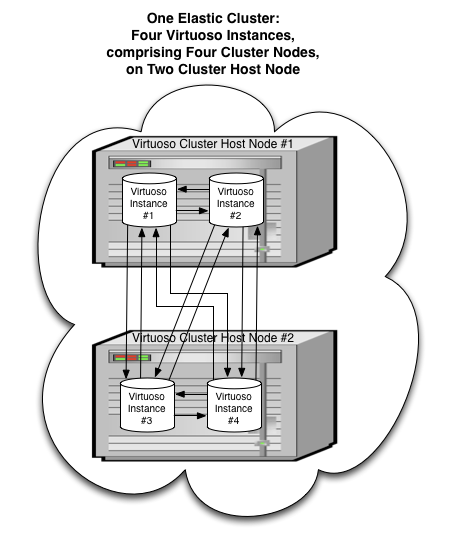 Each Single-Server instance shown in the basic Replication Clustering, above, could be replaced by one of the "clouds" shown below. 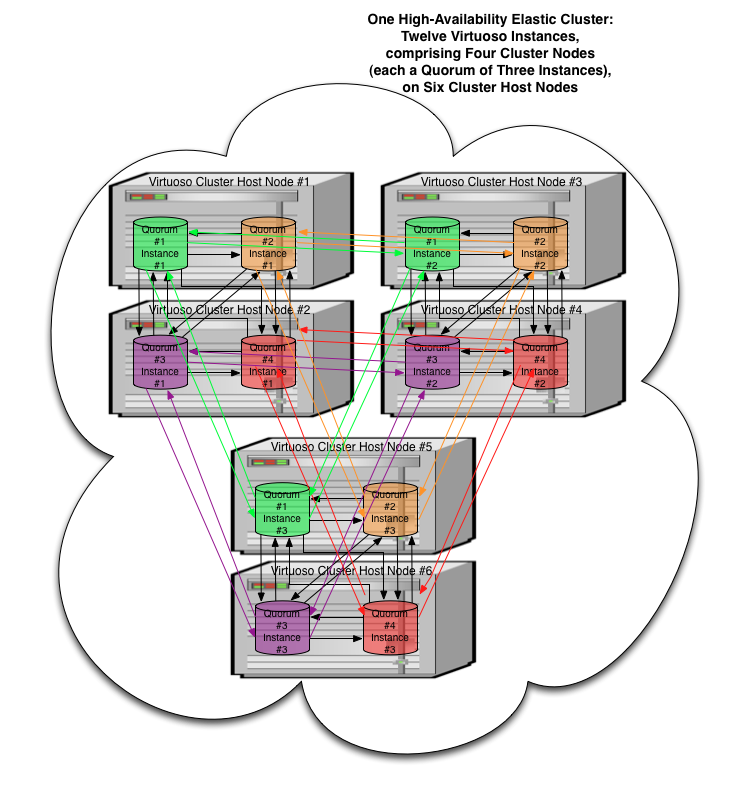 Typically, the deployment configuration within each "cloud" in a given Replication Cluster would be the same as in all the others, but there are circumstances where the instances in a replication cluster might not be identical. 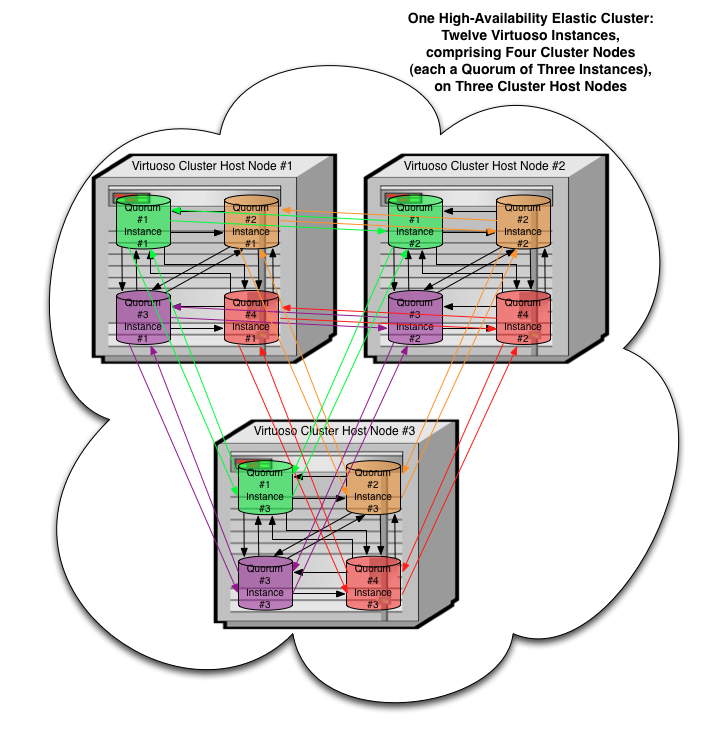 Adding hosts to an elastic cluster provides more resources, and thus improves performance, and increases capacities. The three clouds below may be viewed as a deployment's growth from initial deployment on one host (with one license file), expanding to 2 hosts (and two license files), and on to four hosts (and four license files). The three clouds in this section may be viewed as a high-availability version of the preceding three, likewise evolving from smaller scale to larger scale.